It's Duck Soup: "Why don't you two just Play Nicely?" Last Thursday night at 7:00 PM I drove to the local UPS facility to pick up my new computer. It was an eerie place after dark, no lights on in the lobby, people shuffling about like zombies, trucks lined up outside, empty cars with their lights on. The box was both bigger and skinner than I thought it would be. It was the simplest thing in the world to unpack and set up. Like the original IMac, this is all one unit, but as you can see, it looks just like a stand-alone monitor. It's been designed to the hilt, all the way down to the packaging. The power cord passes through a circle in the stand. The mouse and keyboard are both wireless. The keys on the keyboard are small and flat, very science fictional. The DVD-ROM drive is a slot on the side. There's also a slot that will allow me to insert my camera's memory card direct. The screen is ginormous, easily the largest computer screen I've ever worked at, and wide instead of square. Fast doesn't even begin to describe it. I will be surfing the infobahn in style with this puppy. Except that I can't do anything with it! I have no phone line, no internet. Three times I've called the phone company, and three times they have said "oops," given me a new phone number and a new date. The latest is this coming Friday. It had better work, because I have fewer than fifteen days to register my software, and you have to be online to do that! I also don't have any of my old files. As I discovered when I was disconnecting the old computer, it still works after all (the USB hub that was connected to it was apparently causing the problem -- go figure). That's a good thing -- I haven't really lost any files at all. Yay! But try as I might, I cannot get the new Mac to talk to the old one. I've connected them by ethernet, which should do the trick, except that the new Mac expects certain software to be on the old one, and I can't install that software on the old one because it doesn't have a DVD-ROM drive. System 9 is no longer supported. My new Mac looks at my old one and says, "Feh!" Nor will the new Mac recognize my Jaz drive, which is where everything is backed up. It connects by USB, so there really shouldn't be a problem -- it's just media, not formatted to any particular operating system. So I can't work with any of my existing files. I suspect (and hope) that there is some computer business in town that will, if I bring the old computer to them, download and burn all of its files onto a CD, and that I will be able to transfer them that way; but even that isn't a sure thing. Damn new technology anyway! Here I have a computer with enough horsepower to have filled a room a decade ago, and all I can do with it is take pictures of myself hugging Honey. Technology is great... when it works! Good luck, my friend. Try Staples, they worked a miracle for me last year. 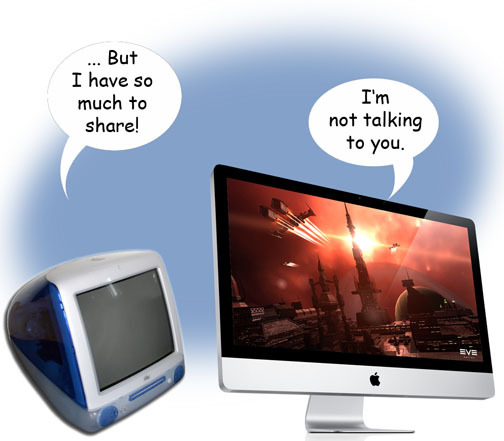 Hey Doug--we're also trying to move stuff from the old Mac to the new. My spouse tells me there's a certain cable that you can use to do it. If he ever gets home when I"m still awake, I'll ask him what it's called. But the switching is a common problem, so there IS a solution. And my "new mac" advice is this--stock up on batteries for that wireless mouse. It goes through them really fast! Glad to hear your sunshiny rooms are making things easier for you!